Line 8x8-inch baking pan with parchment paper long enough to hang over edges. Butter parchment well. Combine sugar and cream in saucepan. Bring to boil over medium-high heat, stirring constantly to prevent burning. Add corn syrup and continue cooking until mixture reaches 230°F on candy thermometer (thread stage). Add butter and stir carefully to combine. Continue cooking mixture until it reaches 245°F (soft ball stage). Remove from heat. Stir in salt (fleur de sel) and vanilla. Pour mixture into pan to cool and harden. Remove caramel block from pan and cut into rectangles, about 2 inches x 1/2 inch each, using sharp, well-oiled knife. 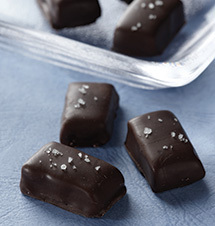 Sprinkle a few grains of fleur de sel on top of caramels before wrapping. To Cover in Chocolate: Melt 12 oz. (2 cups) of chocolate chips. Dip caramels in chocolate and place on parchment paper-lined cookie sheets to set. Sprinkle a few grains of fleur de sel before chocolate is completely set. Fleur de sel is the top layer of salt harvested from the sea. It’s available in specialty food shops and online.